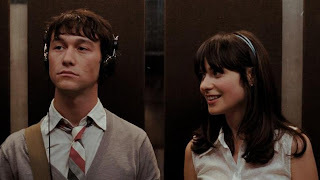 While (500) Days of Summer threatens to become another hopelessly romantic and disposable Sundance whimsy comedy, Marc Webb’s film emerges victorious, rising above other recent hipster crap-outs like “Adventureland” and “Away We Go”. There’s nothing particularly original, playing like a Woody Allen picture told with Cameron Crowe’s pop culture sensibility, but it’s a combination which rings out all the blinding joy and heartbreaking tragedy of love with a lingering poignancy which stays with you for a while. Joseph Gordon-Levitt, since his lead role in “Brick”, has quickly perched himself on the edge of major stardom. His uncanny resemblance to Heath Ledger hopefully doesn’t curse him, but Levitt’s role in this film as well as the as-yet unreleased festival release “Uncertainty” show off a different kind of romantic side. Levitt exposes Tom’s vulnerability with compassion and grace. Webb reverses our expectations of the malecentric point of view – not the beastly male chauvinistic uber-male view but a literary romantic protagonist. Levitt fits it like a glove.